Newton Aycliffe played their penultimate game of the season away to North Shields and came away with a 1-0 win. Shields started the game 22 points ahead of Aycliffe, but Aycliffe dominated the game and should have won the game by a bigger margin. Aycliffe started the better, and Alex Barnes got a powerful shot away in the third minute, but it went wide. Then Kurt Matthews had a shot deflected just wide. From the resulting corner, Gez Richardson got in a strong header, but it was deflected onto the top of the net. From that corner, Aaron Brown had a header tipped over the bar. Aycliffe were well on top, playing attractive football, with Barnes influential in midfield. Ethan Wood and Alan Harrison had good attempts at goal, but both fell just wide. Full-back Connor Phelan went on a good run just before the break, but hit his shot straight at Purvis in the Shields goal. Aycliffe started the second half well, with Richardson’s header just missing the target in the first minute. They had a strong appeal for a penalty turned down in the 55th minute when man-of-the match Kurt Matthews appeared to be fouled as he was about to shoot, when through one-on-one. On 64 minutes, Richardson hit the bar for Aycliffe, and it seemed that it might not be their day. But a minute later, Jermaine Metz got put through by Matthews and he made no mistake to break the deadlock. 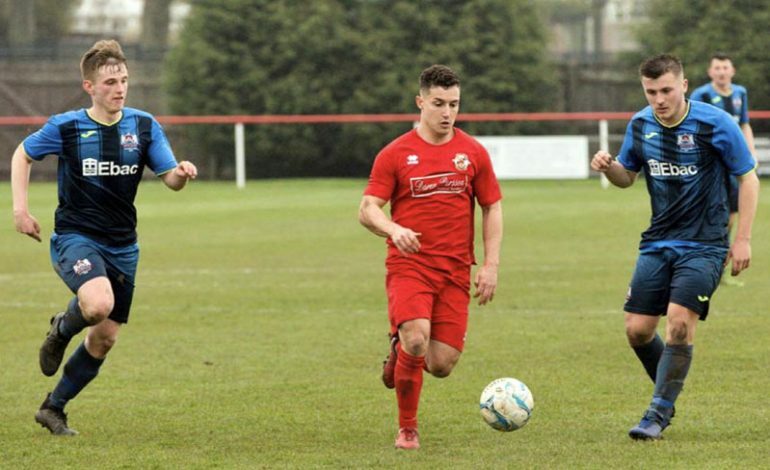 Every Aycliffe player was at the top of their game on the day, as they put in one of their best performances of the season to take all three points. The next game is the last of the season and is at home to Guisborough on Saturday (April 13, 3pm) at Moore Lane Park.